You're right. 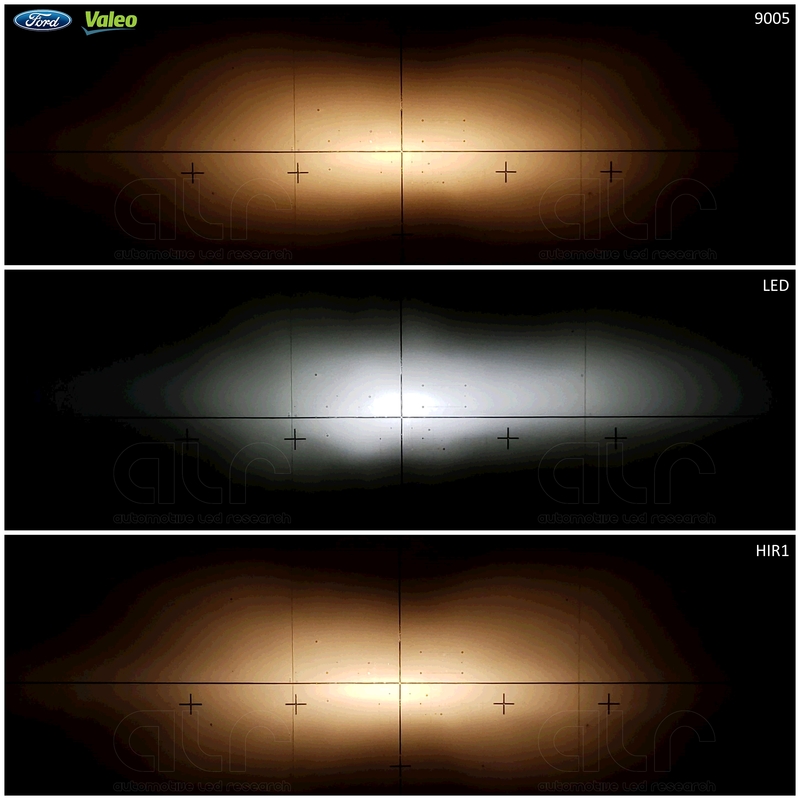 Those halogen projectors (Valeo) in the Edge, Fusion and other vehicles are pretty crappy. The bad thing with that projector design is that LEDs won't do better and neither will HID. Assuming of course that you meant putting H11 based xenon bulbs in your headlights. A HID bulb will glare *badly* in this projector despite giving more light in the rest of the lower beam. There just isn't enough glare control built into this Valeo projector. A H9 is your best bet but will require just a smidge of reaim downward. For the high beam a HIR1-9011 Philips is your best bet for true performance. If I were you, I'd retrofit a set of good xenon D2S projectors or a good set of bi-LED projectors and take those horrible halogen projectors out! SL1 highs won't beat out a HIR1 bulb. HID pnp is NOT recommended for the lows. As I said *way* too much glare in these projectors. Nearly double the federal standard. I'll see if I can run some comparisons later this evening. So I had to chance to run some tests. 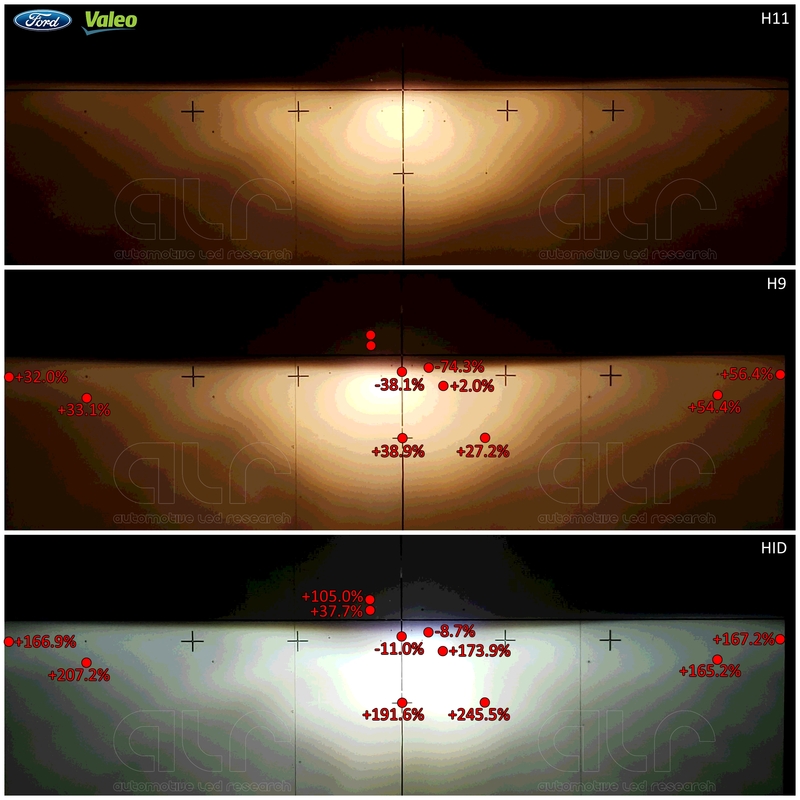 The following images represent the comparison between a H11, H9 and HID in the Ford projector. - Aim for the H11 was set in accordance to the visual optical aim type VOR. - Glare was measured at the TWO test point locations defined in the federal lighting standard. So I take back what I said previously about using a H9. Because the aim has to be lowered slightly to avoid excessive glare, this results in a loss of distance and a gain of foreground. And because the tabs of the H9 are a little different than a H11, it appears to place the filament in a slightly different location optically which results in the hotspot moved to the left of vertical. For the HID, I used the same aim position as the H9 because it didn't matter where I placed the aim. There was simply too much glare. Aiming it down a few more degrees would still result in glare that is non-compliant. Plus putting all the massive amount of light further into the foreground. For the high beam comparison, I thought I could use my 9006 SL1 bulb but the heatsink was preventing it from locking in place because it was rubbing on the 9006 bulb mount. Not sure if a 9005 SL1 would be any different. So I instead used a another LED bulb that had no mounting issues. I only took one reading and that was directly in the center bulls eye (H-V point). But the actual peak is located slightly to the LEFT of the center mark because this is how most reflector high beams are engineered (see HERE for previous discussion). You'll see that the LED bulb positions the peak a little higher than the H-V point (because of its inability to truly mimic the optical point) while both halogen bulbs keep the intensity resting on the horizontal line which will have better long distance reach on the road.